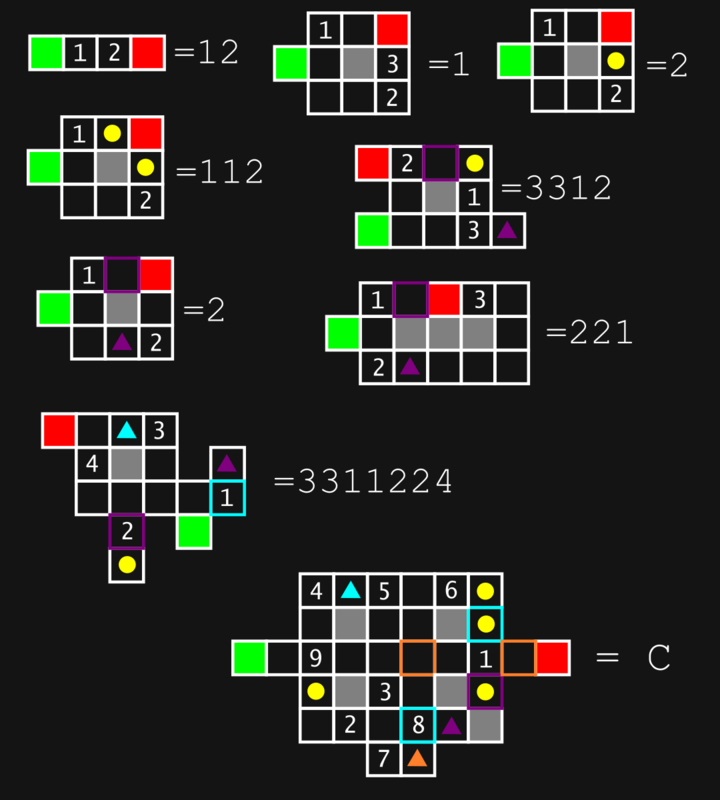 I'm designing a puzzle game, and am trying to play-test some concepts. Can you solve these? 108153767833 = A + B + C. What are the components and why? Note for C: As a hint to correct an oversight, the product of the digits in C is 2488320. 1. Take the shortest path possible starting at green and ending at red. 2. If yellow dots, all must be "retrieved" before reaching red. 3. Red cannot be crossed, thus only reached once. 4. Colored squares are "locked doors" that are only passable once you have "retrieved" the associated colored triangle. Found by @deep_thought. Please review their answer. After working through this and making a mess of a wall of text, I found that @JonMark_Perry was better able to succinctly describe the process. p falls in the range of a to z, thus p is 1. As p is printed twice, the result is 11.
set p-z includes p, t, and y, thus p, t, and y are all 3. Example 3 gets a little interesting. Here, q_1_k translates to ^k-q = 1, or letters not in the set of k-q get +1. 3 also introduces the idea that set values can stack. As such, p is in set a-p and not in set k-q, thus is 1 + 1 or 2.
l is in set a-p, k-q, l-z, thus is 1 + -1 or 2. (Doesn't get the 1 from ^k-q as l is not not in k-q. However, this value appears to be incorrect. However, I can't get my B formula to match. Actually, if we use the slightly modified rule for B5, then we get the desired result! Technically not correct, but I'm happy with it for now. 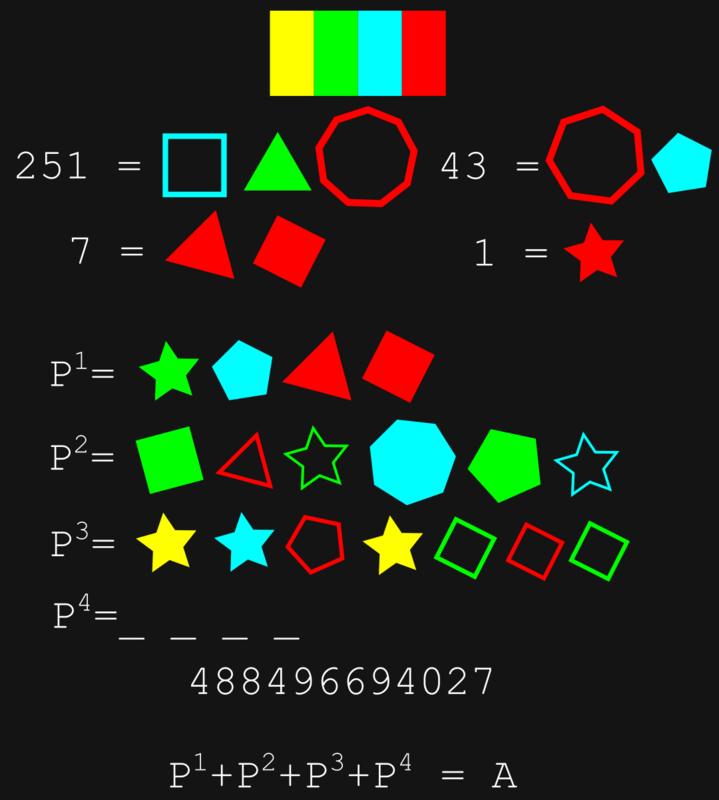 if we ignore tilt and position, then I can fit the four numbers at the top with: colour is power of ten, shape is digit (star is one), filled is positive, empty is negative; sum all shapes. This gives P^1 = 157, P^2 = 857, P^3 = 1201. These are prime factors of the number at the bottom. P^4 is the missing factor is 3023. Their sum is A = 5238. Every a_b_c triple forms a range in the alphabet that scores b points, for example a_1_m means that every letter in [a,m] scores 1 point, with wrapround if the range is backwards. I get $B=8699874484$. Not the answer you're looking for? Browse other questions tagged mathematics visual mazes alphametic . What is the Sixth Number?